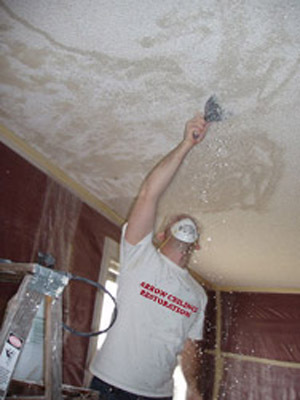 Your one source for Bradenton Popcorn Removal that specializes in the professional removal of acoustic popcorn ceilings! As a result - we are able to offer unbeatable pricing and fast service for your home. You can select to do as little as one room, or the entire home. Arrow Ceiling, a Bradenton Popcorn Removal spceialist provides free estimates... to schedule an appointment email us, or call 941-870-8078. Popcorn ceiling removal is one of the must do items in any remodel or update project. Scraping off your popcorn ceilings provides a very visible, and therefore profitable upgrade to your Bradenton home. The task of removing an Acoustic Popcorn Ceiling is not complicated but it is very hard work and is best done by a qualified professional. Removal of the Acoustic Popcorn Ceiling begins with applying water to every inch of your ceiling. This is done with sprayer that sprays warm water evenly over the ceilings. When the water has soaked into the ceiling the process of scraping begins. This is done by hand, and usually 0n a ladder, scaffold, or lift as necessary. When the acoustic popcorn is substantially removed you will begin to see the results and beauty of this process. But often the ceiling will have inperfections due to the original drywall work. Repairing the Drywall, Recoating the Joints and Nails and smoothing out uneven areas is the final step in the removal process. As you can see this is quite a job! Arrow Ceiling can make a beautiful hand texture on your ceilings. Common forms of texture are Knockdown, and Orange Peel. See our page showing texture samples. If you want a smooth ceiling, your project will require skimcoating. This is the process of applying a thin layer of compound over the ceiling and then sanding it smooth. With your ceilings textured or skimcoated, all there is left to do is prime and paint!